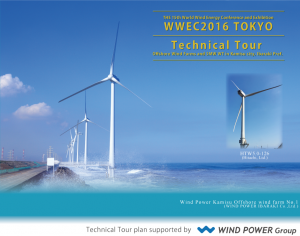 Offshore wind farms and 5MW WT in Kamisu city, Ibaraki Pref. We regret to inform you that Work Shop should be canceled by reason of an epidemic disease (influenza) of the lecturers. 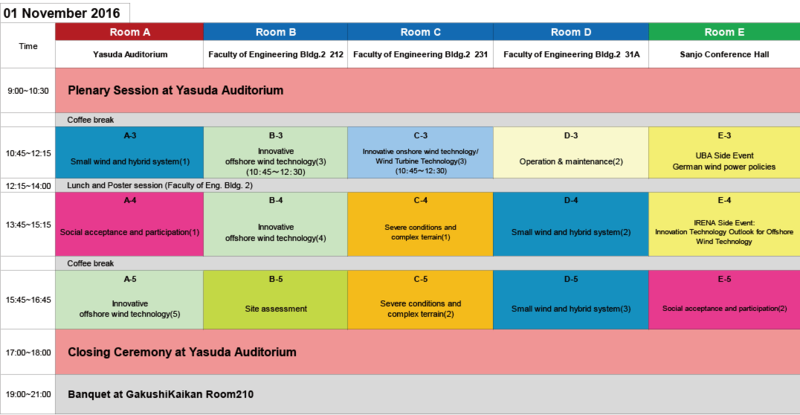 This session will summarize and conclude the conference and its main findings and will summarize the main challenges the global wind community is facing. It will propose next steps and introduce Sweden as the host of the WWEC2017. Also the World Wind Energy Award 2016 will be handed over and the WWEC2016 Conference Declaration will be presented. A-3-4 Numerical Analysis of a small HAWT Dr. Noriki Iwanaga Research Center of Computational Mechanics,Inc. B-1-4 Aero-Hydro-Elastic Analysis of 5MW Semi-submersible Floating Wind turbine in Shallow Waters Mr. Fuminori Hioki Wind Energy Institute of Tokyo, Inc.
B-3-6 Passive cooling system for 5MW downwind turbine Mr. Shigehisa Funabashi Hitachi, Ltd.
B-5-1 Impact assessment of terrain turbulence to wind turbine fatigu Mr. Soichiro Kiyoki Hitachi, Ltd.
C-2-1 A verification of the FRT (Fault Ride Through) capability for 5MW wind turbine system Mr. Yuta Ito Hitachi, Ltd.
C-3-4 Flow field elucidation of the rotary column with fins and lift enhancement of Magnus windmill Dr. Nobuhiro Murakami MECARO Co.Ltd. C-4-1 COMPARISON OF THREE AEROELASTIC CODES ON PARKED WIND TURBINE UNDER EXTREME WIND SPEED CONDITION Mr. Yoshitaka Totsuka Wind Energy Institute of Tokyo Inc.
C-4-4 Wind Power Project in Bhutan Mr. Ruka Ogawa Renewable Energy Business Department, KOMAI HALTEC Inc.
D-1-4 Numerical site calibration procedure for power performance testing of wind turbine Dr. Yuko Ueda Wind Energy Institute of Tokyo Inc.
D-1-7 The assessment of offshore extreme wind speeds on the western coast in Taiwan Dr., Mr. Shih-kai Ciou Sinotech Engineering Consultants, LTD.
D-3-1 Periodic Safety Management Inspections Mr. Takashi Matsunobu Hitachi Ltd.
D-4-3 Micro SAVONIUS for remote Area Mr. Gunatilake Chinthake SocioRecur Co. Ltd.
PS-F-3 How can we use Doppler LIDAR with simulation model in offshore wind resource assessment? (Vertical Doppler LIDAR and CFD model) Mr. Mizuki Konagaya E&E Solutions Inc.
PS-F-4 Accuracy comparison between multiple models of vertical wind Doppler LIDAR Mr. Toshinari Mito E&E Solutions Inc.